Aeration is one of the basic needs of a lovely lush lawn, along with a good fertiliser and regular mowing. It’s often quite easy to see when your lawn needs to be aerated, because the soil becomes compacted along high traffic areas (particularly if you park your car on the lawn) and the grass starts to thin and eventually you end up with bare patches along the line of traffic. Compacted soil prevents roots growing properly, but soils that are heavy with clay or lawns that have more than one or two centimetres of thatch also need regular aeration to keep them healthy. If your lawn has bare patchy spots anywhere, it’s best to aerate the soil and if you notice water pooling after a solid rainfall, then once again, you need to aerate your lawn. Aerating your lawn has four clear benefits. 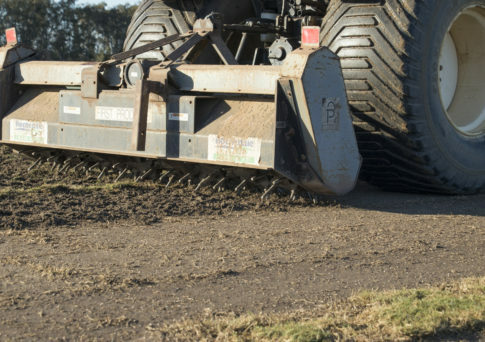 First, it reduces the compaction of the soil, allowing the grass roots to grow deeper into the ground, making it more resilient to the hot dry summers. Second, it helps to reduce the amount of thatch in your lawn, which generally helps to protect the grass roots from too much sun or from becoming too wet or too dry. The problem is that too much thatch can form a barrier over the roots and soil, causing the water to simply run off. Aeration helps to remove this thatch and lets the water infiltrate the soil more easily. Third, aerating the soil allows your fertilizers to enter the soil and reach the roots and last, removing the overgrowth of thatch, allows the remaining thatch to be naturally broken down, releasing nutrients into the soil. The two best times of the year to aerate your lawns are in the spring and autumn. In the spring, aeration helps your lawns to grow lush, because it receives sufficient water and fertilizers, and in the autumn, it helps to strengthen the root system for the winter season. Essentially, aeration involves punching pencil like holes5cm down in the lawn and into the soil, rocking the fork back and forth each time to loosen the soil. This can easily be achieved with a garden fork, but it is time consuming, and takes a lot of energy if the soil is really compacted. If you have a large lawn it’s not something you really want to do on your day off! For larger lawns or if using a garden fork seems like too much work, there is always the option of hiring a spiked lawn roller that is just like a lawn roller but with spikes to penetrate the soil. You will need to partly fill the roller with water to add sufficient weight so that the spikes penetrate the soil and then push it over your lawn repeatedly, to aerate the soil. The last option, if you have really large lawns is to hire someone to do it for you with a ride on aerator and there are plenty of people who specialise in this type of lawn maintenance. You can also hire one of these aerators yourself - if you think that your weekend won’t be complete without whizzing around on a ride on aerator! Finally, once your lawn has been aerated, you need to top dress it with washed river sand and a good fertilizer, raking them into the lawn and following up with a good watering. Now that you know how to aerate your lawn, it’s a good idea to repeat it every year in the spring or autumn to ensure that your lawn stays lush and green all year round. For the best turf in Queensland, call us on 1300 781 175 or shoot us an email.